We are pleased to announce to you the result of the Coca-Cola Live International SMS Draw held in September, 2012. Your Mobile Telephone Number attached to ticket number: 139573490206 750 with Serial number 1395/12 drew the lucky numbers: 08 17 22 30 36, which won in the 1st category of the draw. Your prize is£950,000.00 (Nine Hundred and Fifty Thousand Great Britain Pounds)in cash and has been credited to file MTF/13700117/12. A total cash prize of £50.000.000.00 (Fifty Million Great Britain pounds) was shared among the 126 lucky winners across the globe in different categories. All participants were selected randomly from the Internet and the International Mobile Directory, and extracted from over 100,000 unions, individuals, associations and corporate bodies that are listed in the Mobile Directory. Age. . . . . .
We will immediately start the process to facilitate your funds release as soon as you send the required details. For security reasons, you are advised to keep your winning information confidential until your claim is processed and your money remitted to you. Any form of double claim will lead to disqualification. This prize was awarded to you by Coca-Cola, United Kingdom and cannot be claimed or taken from Coca-Cola in your country. Congratulations from me and members of staff of Coca-Cola. Thank you for your recent inquiry about the Funds Transfer Clearance (FTC). This document is mandatory for all non-UK residents who seek to receive their International prizes from the United Kingdom. This document legalizes your prize and allows you to receive it without any issues with the Government authorities of United Kingdom. Note: The requested fee cannot be deducted from your fund deposited with Lloyds Bank because the Bank has a definite instruction to Transfer £950,000.00 to you in full. If you pay by Bank Wire to our account, it may take 3 - 7 days for the fee to get into our account and we will issue you the FTC after 3 - 5 working days. If you pay by Western Union, we will issue you the FTC within 3 hours.The Western Union/Money Gram Agent may ask you to indicate/say the purpose of transfer. If you indicate lottery/prize, they will demand additional documents which will delay the transfer by days. We advise that you tell them that you are sending the money as gift to a friend in United Kingdom so that they can transfer the fee within 5 minutes. 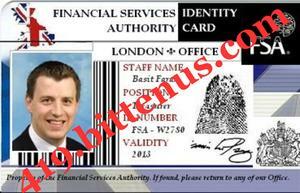 Attached is a scanned copy of my staff identity card for your perusal and we will issue you the FTC upon the receipt of your payment.